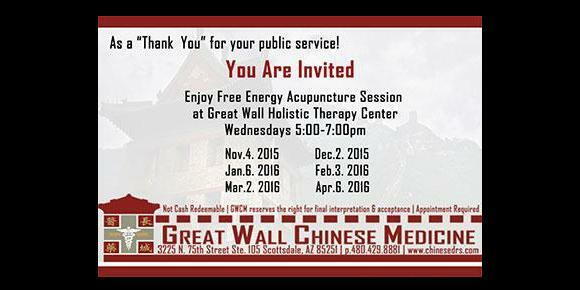 Great Wall Chinese Medicine & Acupuncture (GWCM) Would like to say Thank you veterans by inviting you to one day each month in appreciation for all of your dedication and services! For more than 1- years, we have given back to the community. Now let us help you with your pain or just maintain your well-being. Please book early as there is limited availability.